Whether your adventure requires area lighting or a long distance spot beam, the AMP 5.0 is designed to perform. The soft cycle push button switch offers instant access to the 3 Ultrabright LEDs or the Maxbright Rebel LED, while regulated circuitry provides constant brightness and enough burn time to get you through over 6 days of continuous darkness. You can be sure the Amp 5. 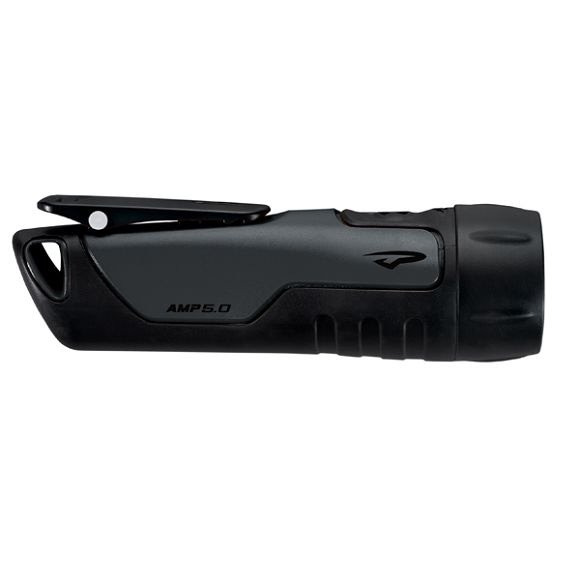 Whether your adventure requires area lighting or a long distance spot beam, the AMP 5.0 is designed to perform. The soft cycle push button switch offers instant access to the 3 Ultrabright LEDs or the Maxbright Rebel LED, while regulated circuitry provides constant brightness and enough burn time to get you through over 6 days of continuous darkness. You can be sure the Amp 5.0 is always available with the convenience of a lanyard loop, clip attachment, and tough rubber over-molded Xylex housing. The highest quality LED available from Lumileds, Princeton Tec&apos;s Maxbright LED is extremely bright and efficient. This single LED emits a smooth, powerful, white light useful for a wide range of tasks. Princeton Tec uses collimators or reflectors with the Maxbright LED depending upon the application. Princeton Tec&apos;s intermediate rating, Level 2, is assigned to lights that offer a degree of water protection equivalent to IPX7 in the International Electrotechnical Commission (IEC) standards. Lights rated at Level 2 provide waterproof integrity down to 1 meter for up to 30 minutes.